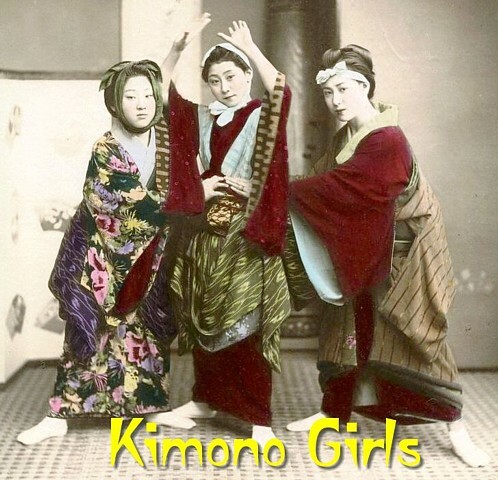 An ebook album of more than a hundred old photo postcards, stereoview slides and antique prints of elegant Japanese ladies in beautiful, traditional kimono gowns, many in early hand-tinted color. Charming, fascinating, nostalgic - sometimes risqué - portraits of pretty geisha girls, gorgeous oriental hostesses in colorful dresses. A downloadable, digital scrapbook, a compendium of haunting classic images from the late 19th and early 20th centuries, depicting a pre-industrial lifestyle that has largely disappeared in modern Japan. (A PDF-format, illustrated ebook / slideshow for Acrobat Reader. Includes optional rolling slideshow functionality.) A great alternative to a screensaver, for your computer's idle moments!